This past week industry experts came together to talk shop. 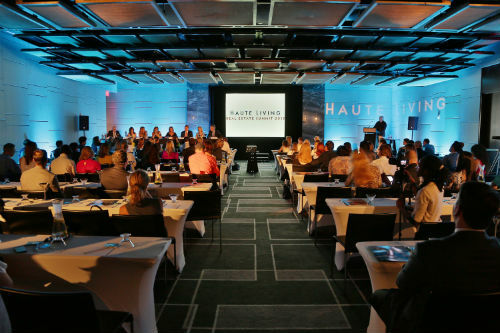 In their case, the topic was Miami real estate at the first "Haute Living Real Estate Summit " held at the W South Beach Hotel. The most successful real estate developers and brokers shared their opinions and differences on the outlook of our dynamic Miami market. "We are in the throes of a great upturn," stated Jorge Perez, Chairman of The Related Group Florida and recipient of the first Tony Goldman Lifetime Visionary Award presented by Haute Living Magazine. Perez advised that we need to have moderation this time around to avoid the boom and bust cycle. "We need to improve community as a whole to make Miami a great city." He stressed the need for attracting companies and building a better employment base to sustain growth. Right now many people from around the world are coming to Miami to park their cash to hedge and hide money from their homeland. But economies shift and change overnight. Thus, having a homegrown population base that lives and works in Miami is important for a sustainable future. The Summit moderator, Seth Gordon, said, "If New York is 90 percent done, and if Chicago is 80 percent done and Los Angeles 70 percent done, then Miami is only 10 percent done." We have developed little of our land mass. Our cultural institutions have room to grow. "Miami needs a lot more entrepreneurial energy," states, lobbyist/strategist, Gordon. "We are a frontier town and luckily attract entrepreneurs. Miami is a very accessible city and newcomers can make an immediate impact." Developer, Ugo Colombo, President of CMC Group, who was one of the early visionaries to start developing in Miami, gave a quick synopsis of the past Miami development phases - In the 80's houses, 90's waterfront condos, 2000 the boom and now 90% of Miami is developed on the waterfront. New opportunities are with interior pockets of land. As developer, Gil Dezer, President of Dezer Properties pointed out, "Miami has physical barriers with the ocean on one side and the everglades on the other." New areas need to be gentrified now. Development is pushing west, but still east of the I-95 Expressway. Developer, David Martin, President & CEO of Terra Group sees a big movement of locals moving from houses to condos as the empty nest syndrome hits. The Doral area near the Miami airport is also growing rapidly. Trump is reinvigorating the area with the redevelopment of the Doral Golf Club and Resort. Miami has always attracted American residents since it has no city or state income tax, unlike New York and Connecticut with high taxes. Don Peebles, Chairman & CEO of the Peebles Corporation, stressed a need to attract the big hedge fund boys to relocate to Miami and bring in big American money. Developer, Edgardo Defortuna, Founding President of Fortune International said, " We have two types of buyers in Miami: those buying to live her and those buying to invest and receive rental income. Miami is still fueled by a lot of Latins." Carlos Rosso, Vice President, The Related Group mentioned, "Today, buyers are more sophisticated and great architecture and design are critical." Peebles stated, "Having a top name architect is needed when pioneering a neighborhood to help elevate and sell the location." Martin said he is always looking to innovate and differentiate and make a home a work of art by utilizing designs by renowned architect. Dezer added that the power of having a 'starchitect' helps create unique properties and attracts bigger audiences. The Summit also touched on how Miami needs to expand its activation of green spaces urbanistically. Parking is another issue in Miami. Gil Dezer who is developing the Porsche project in Sunny Isles, said that is easy to solve. "Just have everyone park in their living rooms." The entire audience burst into laughter knowing that Dezer is doing just that with special elevators that will take owners' cars right up to their floor with a garage attached to their condo. Transportation and the notion of creating a public system still seems unsolvable in the minds of the developers. The root of the problem is that Dade County where Miami is located is made up of too many different cities with 40 jurisdictions. New York in comparison has only one mayor for the five boroughs and one city council. Peebles suggested the Florida governor create a transportation authority like NY/NJ Transit Authority and bypass local officials to solve the problem. The effect of rising interest rates was discussed, but seems to have no immediate impact on Miami since the majority of buyers are paying cash today. "Miami is fueled now by foreigners," stated Colombo. American citizens are affected and cannot pay the big deposits required for new construction. Defortuna remarked, "The availability of credit causes a fictitious buyer." "The higher the deposit required by the developer, the more likely the buyer will close," stated Rosso. Dezer expressed the concern that it is getting harder for Latin Americans to get their money out of their countries. The same is happening for Italians and others in Europe. This is why Miami needs to open up more to American buyers who cannot pay the hefty 50% deposits required now on new construction. Rosso explained how the pre-construction market is working now in Miami. He said, "The Latins are financing the developers and the resales will be sold to American buyers, thus providing an exit plan for the Latin investors since Americans can get financing on resales." Peebles said, "There is pent up demand and there will be more domestic U.S. buyers as our economy improves." He forecasts that we will be good for the next five years. So the morning Summit ended on an optimistic note. The afternoon panel of brokers continued to paint a positive Miami real estate story. Alicia Cervera, Managing Partner, Cervera Real Estate remarked, "Miami is the most amazing city in the world. It is a city built on cash." She added, "The world is moving fast and people want to be in a place that is moving like Miami." Jill Hertzberg of the top American broker team, 'The Jills', discussed how Miami is still lower in price than the places the buyers are coming from like Paris or New York. It is a question of supply and demand. Hertzberg remarked, "Others want the life we have; the action, the fun, the stability". Whenever I return from an overseas trip, I feel like Dorothy from the Wizard of Oz and that there's 'no place like home'." Broker Jorge Uribe, Senior Vice President, Sotheby's International Realty said, "Miami has reinvented itself. We are no longer just about sun, but now have an art scene, gastronomic movement, schooling and astronomically improved quality of buildings." Broker Dora Puig of Puig/Werner quickly added, "Art Basel has changed the whole perspective of Miami." Moderator Gordon chimed in about New World Symphony and Miami City Ballet. Puig continued, "Miami climbed out of the recession and attracted high net worth individuals from around the world." Cervera mentions that our 5 star hotels are attracting 5-star customers. 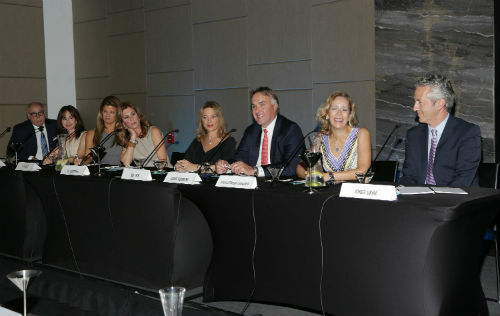 When asked about emerging neighborhoods and areas, the brokers mentioned Edgewater with its exclusive new waterfront projects, Wynwood Arts District expansion, Coconut Grove for redevelopment, Surfside where Bal Harbour is located, the top grossing shopping mall in America, Sunny Isles for oceanfront residential towers and Key Biscayne for single family homes. Craig Studnicky, Principal ISG World, pointed out that all new residential developments are in Dade County/Miami area and Ft. Lauderdale currently has no new projects in the works. The activity and action is all in Miami. The final comment seemed to sum up what we all know about real estate, "Location, Location, Location," as said by Jill Eber, top broker in America with partner Jill Hertzberg of 'The Jills' team at Coldwell Banker in Miami Beach. And luckily, Miami seems to be the one location that everyone in the world wants to come to and own real estate. We are a safe haven for so many seeking a place to put their cash securely and live the ultimate lifestyle. "We must remember that we are all ambassadors of our great city, Miami." states Sotheby's Jorge Uribe in closing. HOPE GAINER is a luxury property specialist with Douglas Elliman Florida working in their Miami Beach office. She regularly writes about real estate for a variety of luxury publications including South Florida Opulence which is distributed to the residents of the richest zip code in America, Fisher Island among other top communities. She handles residential, commercial and property management for her clients and brings her marketing savvy background to the mix along with her extensive global network.